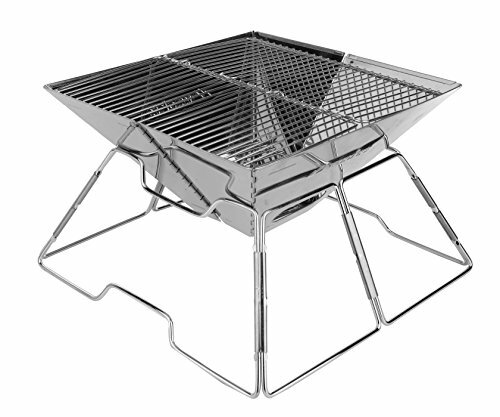 Wealers Compact Folding 16 Inch Charcoal BBQ Grill Made From Stainless Steel. Portable and Great for Camping, Picnics, Backpacking, Backyards, Survival, Emergency Preparation. The WEALERSTM folding grill set is a great way to take grilling with you wherever you go. Whether it's on a camp out, at the RV park or in the backyard, your Quick Grill is a fun and easy way to enjoy a meal with friends and family. The highly compact design allows the Grill to be easily set up and easily folded up for compact storage. Made with 304 premium food grade stainless steel, your Grill will last you years. Each Grill comes with a convenient carry bag. Wealers #1 compact lightweight camping grill, take grilling with you wherever you go, Grill size: 16" x 16"; Great for burgers, fish, steak, hot dogs, corn and more. Made from premium food grade 304 stainless steel. For use with charcoal and wood. Includes carry bag. ct for camping, backpacking, picnics, tailgate parties, rv camping, trailers, parks, and grilling in small spaces. Great for burgers, fish, steak, hot dogs, corn and more. If you have any questions about this product by Wealers, contact us by completing and submitting the form below. If you are looking for a specif part number, please include it with your message.